1. Daughter of Lamech and Zillah and sister of Tubal-cain (Gen. iv. 22). According to Abba b. Kahana, Naamah was Noah's wife and was called "Naamah" (pleasant) because her conduct was pleasing to God. But the majority of the rabbis reject this statement, declaring that Naamah was an idolatrous woman who sang "pleasant" songs to idols (Gen. R. xxiii. 4). 2. An Ammonitess; one of Solomon's wives and mother of Rehoboam (I Kings xiv. 21, 31; II Chron. xii. 13). In the second Greek account (I Kings xii. 24) Naamah is said to have been the daughter of Hanun (Ἄνα), son of Nahash, a king of Ammon (II Sam. x. 1-4). Naamah is praised, in B. Ḳ. 38b, for her righteousness, on account of which Moses had previously been warned by God not to make war upon the Ammonites (comp. Deut. ii. 19), as Naamah was to descend from them. 3. A town of Judah, mentioned with Gederoth, Beth-dagon, and Makkedah (Josh. xv. 41). 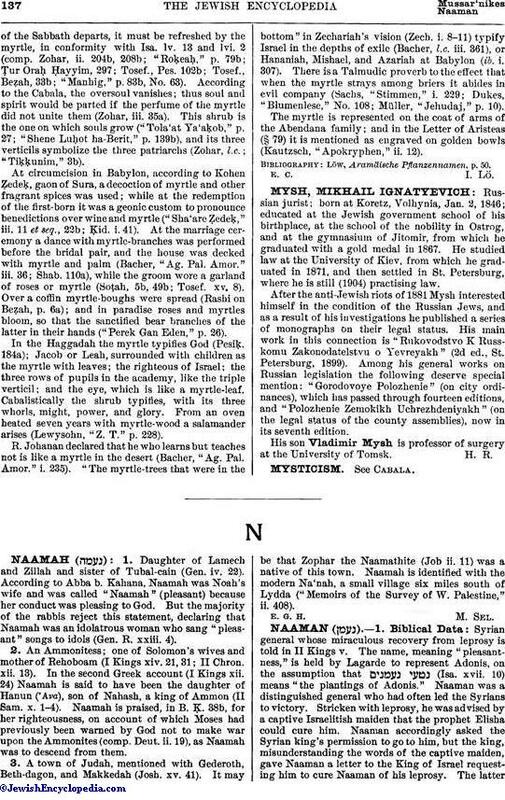 It may be that Zophar the Naamathite (Job ii. 11) was a native of this town. Naamah is identified with the modern Na'nah, a small village six miles south of Lydda ("Memoirs of the Survey of W. Palestine," ii. 408).